For the archival film processing technique that reproduces images of documents, see Microform. Microprinting is the production of recognizable patterns or characters in a printed medium at a scale that requires magnification to read with the naked eye. To the unaided eye, the text may appear as a solid line. 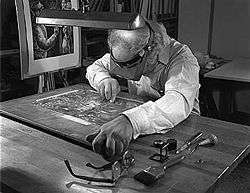 Attempts to reproduce by methods of photocopy, image scanning, or pantograph typically translate as a dotted or solid line, unless the reproduction method can identify and recreate patterns to such scale. Microprint is predominantly used as an anti-counterfeiting technique, due to its inability to be easily reproduced by digital methods. Microprinting is used as an anti-counterfeiting feature, under the assumption that counterfeiters would find it exceptionally difficult to accurately reproduce it without access to uncommon resources. While microphotography precedes microprint, microprint was significantly influenced by Albert Boni in 1934 when he was inspired by his friend, writer and editor Manuel Komroff who was showing his experimentations related to the enlarging of photographs. It occurred to Albert that if he could reduce rather than enlarge photographs this technology may enable publication companies and libraries to access much greater quantities of data at a minimum cost of material and storage space. Over the following decade, Boni worked to develop microprint, a micro-opaque process in which pages were photographed using 35mm microfilm and printed on cards using offset lithography.U.S. Patent 2,260,551AU.S. Patent 2,260,552A This process proved to produce a 6" by 9" index card that stored 100 pages of text from the normal sized publications he was reproducing. Boni began the Readex Microprint company to produce and license this technology. 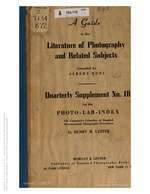 He also published an article A Guide to the Literature of Photography and Related Subjects (1943), which appeared in a supplemental 18th issue of the Photo-Lab Index. Currency commonly exhibits the highest quality (smallest size) of microprint because it demands the highest level of counterfeiting deterrence. For example, on the series 2004 United States $20 bill, microprint is hidden within the border in the lower left corner of the obverse (front) side as well as the Twenty USA background. Bank cheques as well as various other items of value may also commonly leverage microprinting methods, but generally not of such extreme size. For example, personal bank cheques commonly denote the characters MP next to the signature line of the check; these characters represent microprint and are used as an anti-counterfeiting feature due to their difficultly in being reproduced and simple deterrent as a warning that the item employs microprint. While microprinting on such medium may be readable to the human eye without microscopy, there is no differentiation between microprinting at these different scales. The first US postage stamp to incorporate microprinting was the American Wildflower Series introduced by The United States Postal Service in 1992. It was also the first commemorative stamp wholly produced by offset lithography. The USPS has since issued other stamps with more complex microprinting incorporated along with dates, words, and abbreviations such as USPS and even entire stamp designs composed of microprint letters. Microprint of the smallest scale is only producible by hand using engraved offset printing plates or some other method of Intaglio (printmaking). Digital microtext printers utilize specially designed fonts and ink for the purpose. The ink used is most commonly MICR (Magnetic Ink Character Recognition) toner particles but may also be polyester based toners and styrene acrylate polymer based toners. The ink is not limited to grayscale only, but may also use color toners or even more specialized toners containing dyes sensitive to ultraviolet or infrared radiation and producing fluorescence when exposed to those radiations. Microprint of the scale capable by other printing methods can not be produced by a digital printer regardless of the resolution of the device . 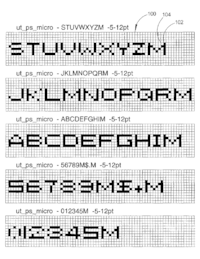 Some digital fonts are designed specifically for the purpose of microprinting. These pseudo-microprint fonts are referred to as microtext. Xerox was acclaimed for developing a microtext font they claimed could produce characters 1/100th of an inch tall. 1/100th of an inch is equivalent to 0.719 points. In April 2015, Videojet Technologies released their 1650 High Resolution (HR) and 1620 HR Continuous Inkjet (CIR) printers, said to be capable of printing sub-pixel size characters as small as 0.6mm in height (equivalent to 1.70079 points). The printers use a 40-micron nozzle that outputs more than 100,000 drops per second of ink. While these printers make microprinting faster and easier to produce digitaly, they still have not reached the true sub-pixel size of less than 1 point. The smallest scale microtext a laser printer can produce is 0.5pt. Using gold nanoparticle inks on a glass substrate, scientists concluded that it was possible for them to control the production of print patterns to a scale of 2 microns. After printing, the nano-particle ink suspension was heated using a gaussian laser, as it was heated, the glass would expand due to the thermal conductivity of the gold nano-ink. In further experiments, they were able to fuse the nano-particles together into a tighter formation a continuous conductive line. Such experiments did not directly include font characters but could translate to such usage. ↑ Price, Miles (April 1953). "The Microcard Foundation". 39. American Bar Association: 304–305. ISSN 0747-0088. Retrieved 9 October 2015. ↑ Metcalf, K. D. (1945-03-01). "The Promise of Microprint: A Symposium Based on The Scholar and the Future of the Research Library" (PDF). College & Research Libraries. Association of College and Research Libraries. American Library Association. 6 (2): 170–183. doi:10.5860/crl_06_02_170. ISSN 2150-6701. Archived from the original (PDF) on 2013-01-10. Retrieved 2015-10-08. ↑ Boni, Albert (Summer 1951). "Microprint" (PDF). American Documentation: 150. Retrieved 2015-10-08. ↑ Raney, M. Llewellyn (April 1940). "The Minicam turns scholar" (PDF). Quarterly Journal of Speech. The University of Chicago. 26 (2): 180–186. doi:10.1080/00335634009380548. 1 2 Trimm, Harold H (2005). Forensics the Easy Way. Barron's Educational Series. p. 276. ISBN 0-7641-3050-1. Retrieved 2015-10-05. ↑ Chenevert, James. "Security Features of United States Postage Stamps 1974-2009" (PDF): 1. Retrieved 2015-10-07. ↑ "Xerox Scientists Develop Microtext Font; Digitally Printing Tiny Words And Numbers Will Help Make Documents More Secure". Xerox Corporation. Retrieved 2015-10-05. ↑ This article incorporates public domain material from the National Institute of Standards and Technology document "Conversion Factors for Science, Engineering, and Industrial Terms" (retrieved on 2015-10-05). ↑ Anderson (2015-04-09). "Enhanced Microprinting Technology Featured in Latest Videojet 1000 Series Release" (Press release). UBM Canon. Retrieved 2015-10-07. ↑ "A Comparison of Laser Printed Microprint Fonts and Practical Considerations for Use in Prescriptions" (PDF). 16 Jan 2009: 3. Retrieved 2015-10-05. ↑ Bieri, Nicole Renée (2004). Transport Phenomena in the microprinting and laser annealing of Gold Nanoparticle Inks (PDF) (Ph.D.). Zurich, Switzerland: Swiss Federal Institute of Technology. p. 167. Retrieved 2015-10-05.